Build on What You Know So far, you learned about the changes expansion brought to Roman society. Expansion would also change the balance of power in Rome's republican government. These changes would lead to the overthrow of the republic. ESSENTIAL QUESTION What led to conflict in Rome? As Rome expanded, many wealthy Romans neglected their civic duties. They thought only about gaining even more power and wealth. This increased the differences between rich and poor. As a result, the threat of uprisings grew. Reformers tried to relieve these problems. They wanted to break up the huge estates and give land to the poor. But the wealthy landowners in the Senate felt threatened. They opposed the reforms and had the reformers killed. 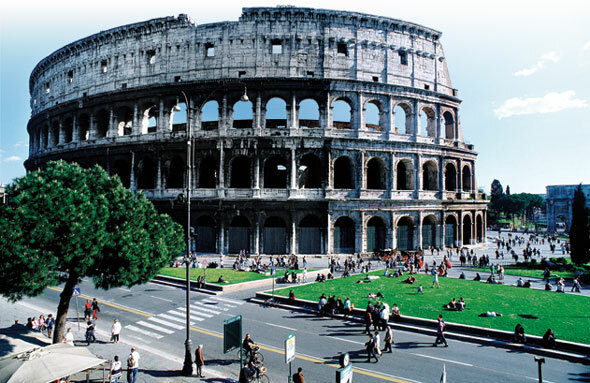 Colosseum - The Colosseum is a lasting symbol of the power of the Roman Empire. Many stadiums built since have been modeled on the Colosseum. At the same time, generals who had conquered other lands became ambitious for power at home. They hired poor farmers to serve under them as soldiers. Increasingly, these soldiers shifted their loyalty from the republic to their general. The generals' desire for power led to conflict. Eventually, civil war broke out. A civil war is an armed conflict between groups within the same country. On one side were the generals who supported the cause of the plebeians. On the other were generals who were backed by patricians and senators. A general named Marius fought for the plebeians, while a general named Sulla fought for the patricians. The struggle went on for years. Finally, in 82 B.C., the patricians won. Sulla took power and became a dictator. 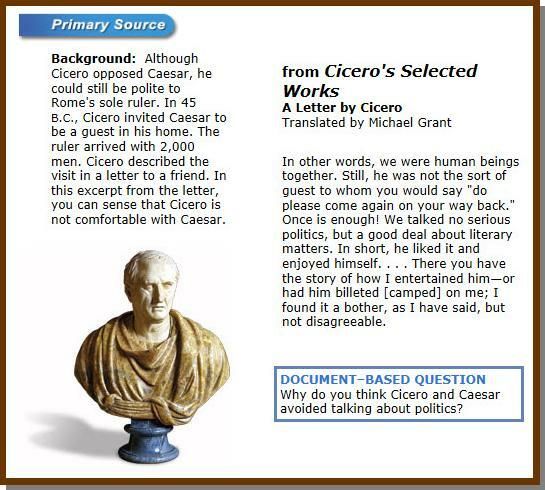 ESSENTIAL QUESTION Who was Julius Caesar? After Sulla died, other generals rose to power. One of them was Julius Caesar. Caesar was born around 100 B.C. into an old noble family. He was a man of many talents and great ambition. But to achieve real power, he knew he had to win on the battlefield. Caesar first saw military action in Asia Minor—part of present-day Turkey—and Spain. But he proved himself to be a great general in Gaul, the area now known as France. The Gauls were fierce fighters. But in a brilliant military campaign, Caesar defeated the Gauls and captured the entire region. His conquests won new lands and great wealth for Rome. The victories also won fame and fortune for Caesar. 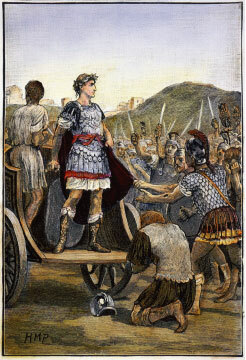 Caesar - In this 19th-century wood engraving, soldiers bow down to Caesar after he won an important battle in 47 B.C. After the battle, Caesar had the following message sent back to Rome: "I came, I saw, I conquered." In addition to his military skills, Caesar was also a good politician. He gained a reputation as a reformer who supported the common people. This, plus his military fame, made him popular with the plebeians. When Caesar returned from Gaul, the Senate ordered him to break up his army. Instead, he led his soldiers into Italy and began fighting for control of Rome. After several years, Caesar emerged victorious. In 46 B.C., he returned to Rome, where he had the support of the people and the army. That same year, the Senate appointed him the sole Roman ruler. In 44 B.C., Caesar was named dictator for life as opposed to the usual six months. Caesar governed as an absolute ruler, but he started a number of reforms. He expanded the Senate by including supporters from Italy and other regions. He also enforced laws against crime and created jobs for the poor. Despite these reforms, some Romans feared that Caesar would make himself king. Not only would he rule for a lifetime, but his family members would also rule after him. Roman hatred of kings went back to the days of Etruscan rule. Concern over Caesar's growing power led to his downfall. As you read in Starting with a Story, Caesar was assassinated in 44 B.C. by a group of senators. The leaders of the conspiracy were eventually killed or committed suicide. Historians still disagree about Caesar's rule, just as Romans did at the time. Some say he was a reformer who worked to help the people. Others say he was a power-hungry tyrant. In either case, Caesar's rule and his death would bring an end to the republic. Silver Coin - This coin was issued after Caesar's assassination. One side of the coin (left) shows a profile of one of the assassins. The other side shows a cap of liberty between two daggers. ESSENTIAL QUESTION What happened to Rome after Caesar's death? After Caesar's death, several Roman leaders struggled to gain power. One of these men was Caesar's great-nephew and adopted son, Octavian (ahk•TAY•vee•uhn). This struggle led to civil war, which lasted for years. The war destroyed what was left of the Roman Republic. Eventually, Octavian defeated his enemies. In 27 B.C., he became the unchallenged ruler of Rome. In time, he took the name Augustus (aw•GUHS•tuhs), which means "exalted one," or person of great rank and authority. Augustus was the first emperor of Rome, but he didn't use that title. He preferred to be called "first citizen." He restored some aspects of the republican government. Senators, consuls, and tribunes once again held office. But Augustus had power over all of them. Augustus governed well. He brought the provinces under control and strengthened the empire's defenses. He also began a civil service. A civil service is a group of officials employed by the government. The Roman civil service collected taxes, oversaw the postal system, and managed the grain supply. Augustus also rebuilt and beautified Rome. He built grand temples, theaters, and monuments. He replaced many old brick buildings with structures in marble. Under Augustus, Rome became a magnificent imperial capital. The reign of Augustus began a long period of peace and stability in the Roman Empire. This period is called the Pax Romana, or "Roman Peace." The Pax Romana lasted for about 200 years. During this time, the empire grew to its greatest size, about 2 million square miles. Under Augustus, the Roman army became the greatest fighting force in the world. Around 300,000 men served in the army. They guarded the empire's frontiers. They also built roads, bridges, and tunnels that helped tie the empire together. In addition, Augustus created a strong Roman navy that patrolled the Mediterranean Sea. The Pax Romana continued long after Augustus died in A.D. 14. Many other emperors ruled after Augustus. Some were good rulers, while others were not. But the government begun under Augustus was so effective that the empire continued to do well. Agriculture and trade helped the empire prosper. Farming remained the basis of the Roman economy, but industry also grew. The manufacture of pottery, metal goods, and glass increased. So did the production of wine, olive oil, and other food products. 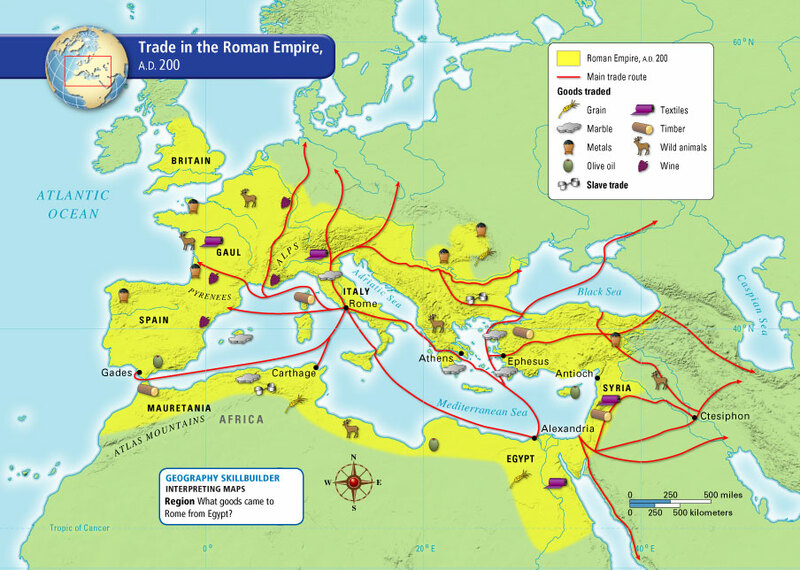 The empire fostered economic growth through the use of trade routes. Traders sailed across the Mediterranean Sea to Spain, Africa, and western Asia. They also traveled by land to Gaul and other parts of Europe. Through trade, Rome acquired valuable goods not available at home. Traders brought back grain, ivory, silk, spices, gold and silver, and even wild animals. Much of this trade relied on the quality of Roman roads. It also relied on the security provided by the Roman military. The Roman economy was also united by a common currency, or money. In Augustus' time, a silver coin called a denarius (dih•NAHR•ee•uhs) was used throughout the empire. A common form of money made trade between different parts of the empire much easier. Traders could buy and sell without having to change their money into another currency. Rome's expanding economy largely benefited those who were already wealthy. As a result, the division between rich and poor became deeper. Motto - SPQR stands for "the Senate and the people of Rome." This was the motto of the Roman Empire. The results of Roman expansion produced social conflict and civil war. Julius Caesar gained power and became a dictator but was then assassinated. The reign of Augustus began a long period of imperial rule and peace in the Roman Empire. Rome faced the problems of how to maintain peace, law, and order. Modern governments face similar problems.